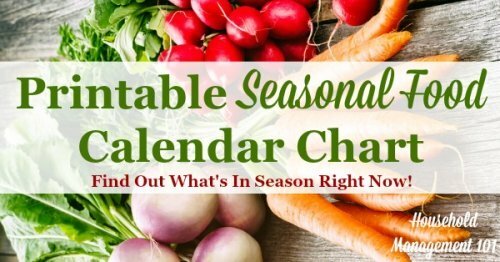 Here's a free printable seasonal food calendar for North America, showing when produce is in season, to help you save money and for meal planning. 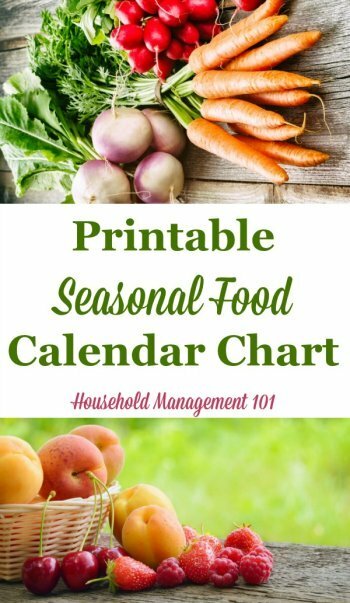 As you work on your family menu plan and grocery budget, this seasonal food calendar chart will come in handy. You'll know what to look for in the grocery store that will be in season, which means it will taste its best, and also will more likely be available at the lowest possible price. The result will be a lower food budget while you enjoy your favorite delicious foods year round. In addition using this chart is an easy way for you to reference what produce is available during the spring, summer, fall and winter months when planning meals. As you begin planning your family menu for the next month you can look to see if a potential vegetable or fruit should be available in your grocery store. While most, if not all, of these items are available year round in many locations the prices are typically higher when out of season, plus often don't taste as good. In addition, you can purchase seasonal produce at the lowest price and prep to preserve it, such as by freezing or canning it, so you can use it year round, regardless of season. 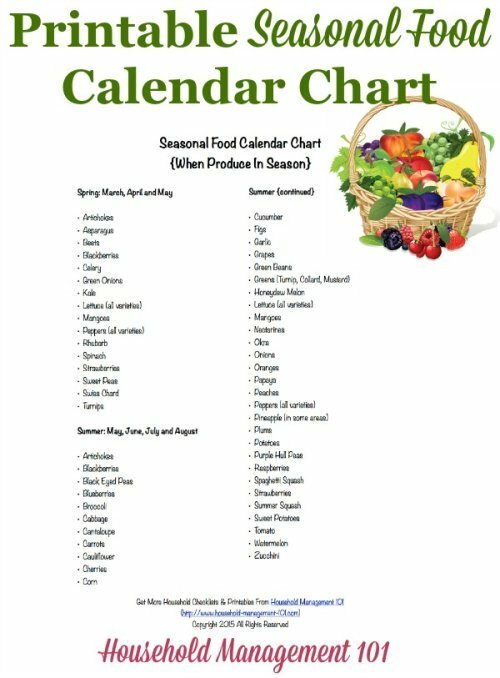 Remember, this seasonal food calendar chart is a great addition to your household notebook or menu planning kit so here's the information, and to get the printable of this information scroll down to the bottom of the page. Once you purchase (or grow) whatever produce you prefer, make sure to check out my friend Marybeth's article on how to store fresh produce to make sure you're doing it right, be that in the refrigerator, out on the counter, in your pantry or wherever else depending on the type of produce you've chosen. Get your free version of the chart here. Make sure you put it in your household notebook!